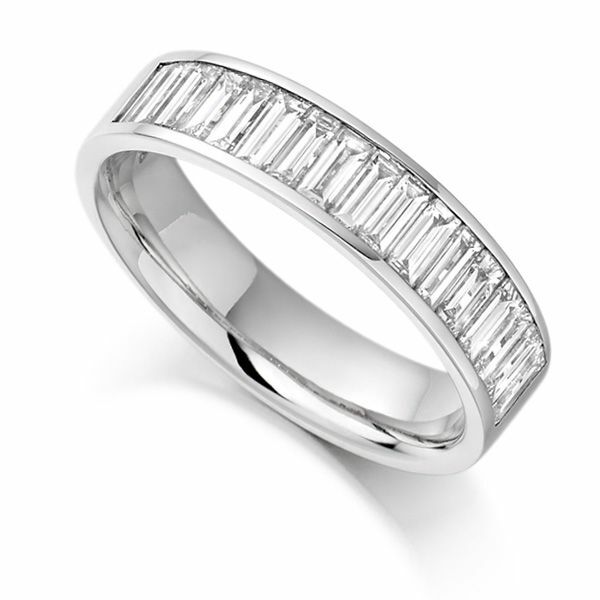 Baguette cut diamond half eternity ring, holding 1 carat of baguette cut diamonds across a 4.7mm wide ring design. This decadent half Diamond Eternity Ring features Baguette cut Diamonds held within a distinctive channel setting. Meticulously set and polished, we craft each Eternity Ring to order working to unfaltering standards. Elegantly styled, a consistent width features 4.5mm Baguette cut Diamonds across a 4.7mm wide band, styled with a comfortable court shaped profile. Each eye-clean Diamond achieves F Colour and VS Clarity, weighing 1 carat in total Diamond weight. This impressive half set Eternity Ring is available within 4 weeks, crafted from a choice of Palladium, Platinum, 18ct White, Yellow or Rose Gold.